A tiny piece of Irish Moss. It usually is in clumps. It’s been a while since I wrote about foraging. I’ve been kind of preoccupied with the Canada Food Guide and what’s growing in my and other people's gardens. But do I have a good one for you today. For this one we have to get our sneakers wet, or at least go barefoot. We’re going to the beach! Every time the tide recedes the grocery store opens if you know what you’re looking for. It could be clams, mussels, or even dulse. This time we’re looking for Chondrus crispus, otherwise known as Irish Moss (or carrageen moss). This most definitely not the kind that grows in beautiful mounds in your garden. This is delicate purplish seaweed that you see on the beaches and in tidal pools of the North Atlantic. Don’t be grossed out. You almost certainly have already eaten it. 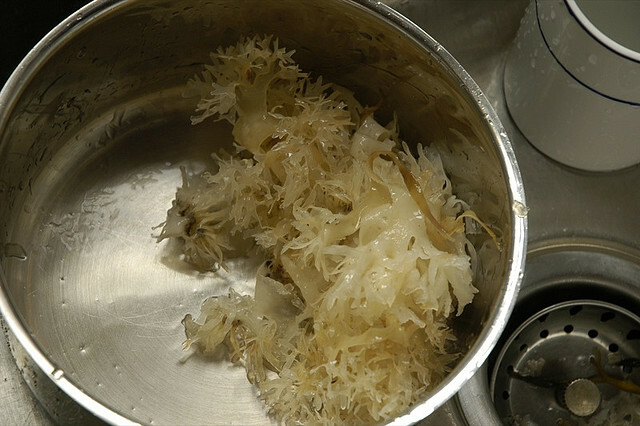 Irish moss is used extensively by the food industry to make jelly and as a smoother/binder. Products with carrageenan range from ice creams, deserts, and drinks to savory foods. 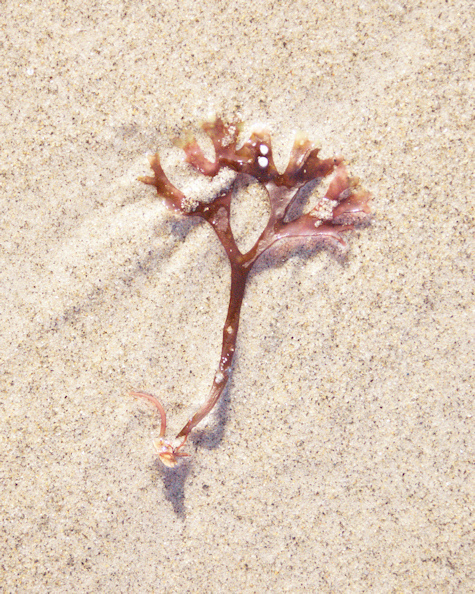 Irish moss is a frilly marine algae three to six inches high with flat, progressively forking fronds, often found in unbroken mats in shallow tide pools. Its color ranges from green to ochre to purplish brown. It contains large amounts of carrageenan, a substance used in making ice cream, gelatin, even beer. The Irish have gathered and eaten the moss for more than 600 years, hence the name. While Irish moss has a supple, leathery texture when freshly picked (easily done by wading along the low-tide mark and gently pulling the individual plants free), boiling transforms it into a gelatinous "pudding" with a delicate sea flavor. (Some have described it as “almost tasteless.”) Top with a bit of vanilla, milk and sugar for a treat New Englanders have enjoyed for years. Irish moss is spiny and tough when dried, but is readily reconstituted and converted to a gelatinous state after boiling 30-40 minutes back home. After soaking for several hours. The colour tends to drain away. Irish Moss contains Vitamins A,B,C,D. Irish Moss is also an excellent source of minerals and nutrients such as sulphur compounds, protein, iodine, bromine, beta-carotene, calcium, iron, magnesium, manganese, phosphorus, potassium, selenium, zinc, pectin, B-vitamins and vitamin C.
Notably absent from a vegetarian diet, sulphur-containing amino acids, such as taurine, are abundant in Irish moss, more than in any other type of seaweed. Clinical trials have found that carrageenan is one of the first substances to attack the common cold virus in the body (and not just the symptoms). It is also under study for beneficial protection against herpes, HPV and HIV infections. Most of these studies are at an early stage and trial results have not been conclusive. How do you use this exotic ingredient? Just so you know, it's also used in the manufacture of beer, toothpaste, shoe polish, pet food and personal lubricants. How to prepare for use: Soak and pick through the Irish moss using several changes of lukewarm water for a few hours. Make sure it is very clean. 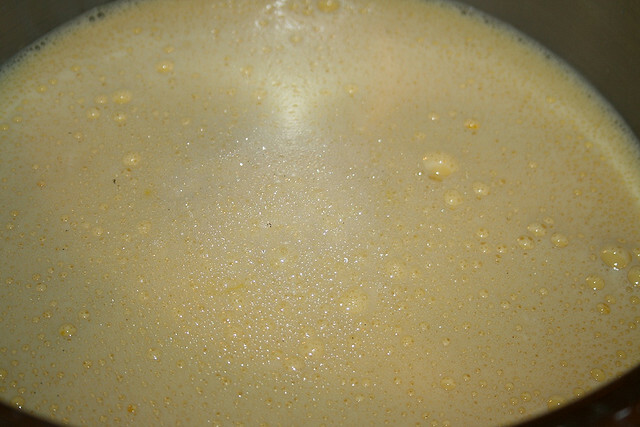 How to use: (one method) Blend the Irish Moss with some water until it is well broken down and very creamy. It can be cooked "as is" (like listed above), or added to recipes creamed. It can also be used "raw" as a thickener in recipes and then strained out, as in the method below. How to store: Dried moss can stay up to a year in a cool dry place, as the salt will preserve it. You may also blend the soaked moss with a little water until you get a thick creamy consistency; store it in a closed glass jar in the fridge for up to 3 weeks. First prepare the crust. Add all ingredients together. Mix well and press into a 10” spring form cheesecake pan. Refrigerate. Secondly, prepare the moss by soaking and washing it in three changes of cold water. Wash, soak for 5 minutes, wash, soak for 5, wash and soak for 5 more minutes. (15 min total). Each time you change the water check for shells, small stones and dark spots. Pour the cream into a double boiler to heat. When at the boiling hot, add the washed moss and orange zest and cook for thirty minutes. The mixture will thicken up when chilled. Strain the mixture through a fine sieve, stirring the moss to allow all the milk to drain out. Add the remaining ingredients to the cream. Stir well to dissolve the sugar. Pour into the prepared crust and refrigerate. Make the compote about 1/2 hour before serving the pie. 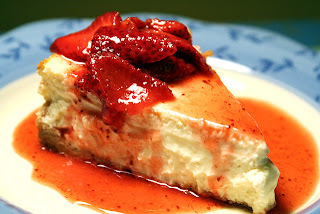 It isn’t advisable to do the sauce and then refrigerate as refrigerated strawberries are always more sour. Place the strawberries in a food processor with the Grand Marnier and sugar. Pulse a few times to combine to your desired consistency. You should still have well distinguishable chunks of strawberry. To serve, top slices of the pie with the strawberry compote and whipped ream if desired.